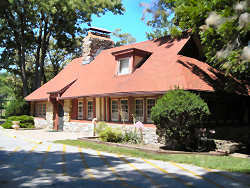 Unity Village Chapel began as a small group that met informally at the Pool Clubhouse in the fall of 1922. Mrs. Rickert Fillmore (Harriet) was among the founders of the group. The group, led by E.V. Ingram, began formal Sunday meetings in December. From 1924 through 1930, adult Sunday School was held in the mornings; Sunday service was held in the evenings with speakers including George Carpenter, Charles Fillmore, Lowell Fillmore, Myrtle Fillmore, Candace Hickson, Ella Pomeroy, Betty Simmons and Ralph Tackett. 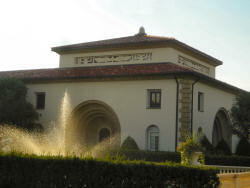 In 1929 the meetings were moved to the original Silent Unity Building, now the Education Building, and the group was known as the Unity Community Society. In December 1931, the group was formally organized as the Jackson County Unity Center and Unity Licensed Teacher, Nora Lee Stevenson served as the leader with an average attendance of 100-150 through 1942. Nora was followed by Donald O'Connor, Nettie Wyatt and Francie Gable serving as leaders. During the period of 1949 through 1975, services were held in the Administration Building's Village Hall and the name of the group was officially changed to Unity Village Chapel after the incorporation of Unity Village as a city. Ralph Rhea served as minister followed by J. Sig and Jane Paulson. The Activities Center Building, with a capacity of over 1,100 seats, was dedicated at the Minister's Conference in June 1975. In 1978, Frank and Martha Giudici were hired as Chapel ministers. With the retirement of the Giudicis in 1987, Christopher Chenoweth joined the Chapel as senior minister. Since that time, senior ministers had included Harriet Valliere, Sharon Connors and Robert Robinson. In 2006, Unity Village Chapel became a corporation independent from, but in collaboration with Unity Worldwide Headquarters. In 2011, Unity Village Chapel hired Rev. Erin McCabe as Senior Minister. She was the first female recipient of the Unity Village Chapel's Men of Unity scholarship when she was as a ministerial student of Unity Institute from 2003-2005.